Re: Where did this image come from? It's from a movie. Against All Odds. Against all Odds eh....I cant say Ive ever seen it but it appears to show an eagle in it and its got a Ferrari driving down the wrong side of the highway...Its gotta be a good movie!...Was I right about the California part? I've never actually seen it, to be honest.. hah. According to IMDB, it takes place in LA and Mexico, so yeah. Cali plates most likely. I saw that movie when it first came out. It has Alex Karras in it, the former Detroit Lion. I didn't notice the Eagle back then. It didnt used to be a shock to see Eagles in movies....Now when I see these old movies again I get all excited...Its kinda the highlight of the movie....Ill bet if one was to sit down and study old 80's movies frame by frame you would probably see alot of them. I've seen that movie, but I don't remember the eagle in that scene. 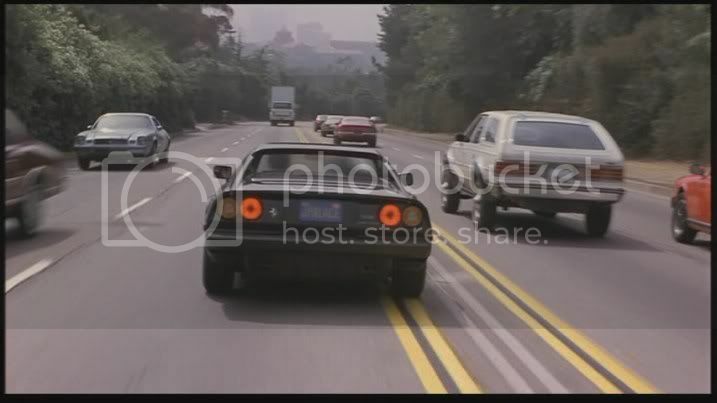 James woods is kind of the 'heavy' in this movie, and he's racing with Jeff Bridges (who's in a porsche) up that road. Rachel Ward is the girl in the 'love triangle' with Bridges and woods. That's the only actors I can remember. Rachel Ward was such a hottie then. But so are the eagles. Is it just me or is that Eagle lifted up all to high heaven!? Yeah, looks a bit lifted to me. Also appears to have the factory roof rack delete. Looks to me like it is the west end of US66/Sunset Blvd going toward PCH.